In life, there are many daunting mysteries that we face. However, the biggest mystery of all is arguably the secret to success. While not everyone is willing to work for success, it is something that everyone wishes to achieve in some way. People are fascinated with stories of outstanding achievement and hope that one day the proven recipe for success will find them. Dog fanciers are certainly no exception to this rule and are always searching for the secret to success in show. 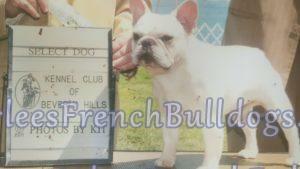 Above you will see photos of my male French Bulldog Grand Champion. He is a stunning dog who was able to achieve the prestigious rank of Grand Champion in only 6 months and is currently the star of Arlee’s French Bulldogs. The following information is intended to help other French Bulldog fanciers to help their dogs achieve the same ranks as our boy. The fancy is composed of a wide array of both hobbyists and professionals who have a wide variety of hopes, dreams and goals. Spend a few moments with any fancier and they will tell you that their best moments consist of the award of the 15th point followed by their French Bulldog’s new championship title followed closely by the ability to compete in the Best of Breed and Group level. Some of you may wonder exactly what a champion title signifies for a French Bulldog. Ideally, it’s purpose is to validate the quality of the dog itself. Statistically, after a dog earns a championship title, fewer than 20 percent continue to compete in the Champion class. Since May 2010, those statistics have become somewhat skewed with the introduction of the American Kennel Club’s Grand Championship (GCH) program. The Best of Breed or Champion class is also referred to as the “Specials” class. Webster’s Dictionary defines special as “exceptional or highly valued.” Does this definition of special apply to all the dogs exhibited in that class? It is fair to say that judges should expect very high quality, and they are obligated to hold those competing in this class to a higher standard than those dogs competing in the non-Champion classes. 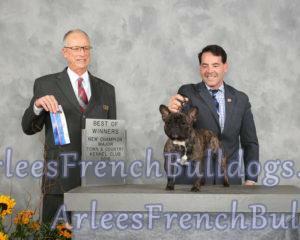 Please stay tuned for the French Bulldog Grand Champion’s qualities and requirements in part 2 of this article!